The Jamba Appliances 58916 Quiet Shield Blender is one of the quietest blenders we have reviewed. It has a special noise enclosure that goes over the blender. It has a low profile design, making it easier to fit under 18-inch cabinets on your countertop. The “Jamba” name is known for smoothies from Jamba Juice shops across the country. This blender was designed to Jamba’s specifications. The Jamba Quiet Shield is a powerful blending machine with 1,190 Watts of power with a 1.6 HP motor. This blender was designed for making smoothies without grit, even green smoothies with Kale and Spinach. It can also make creamy shakes, sauces, nut butters, whole juices, and more. Its metal drive and stainless steel blade pulverizes ice cubes and tough fruits & vegetables. Included is a low profile 32 ounce BPA-free plastic container, and a smaller personal sized 20 ounce travel cup. The 20-ounce travel cup has a flip-top lid. Both containers have easy-to-read measurement markings. A tamper is included to push down ingredients and help blend thick or frozen ingredients. The Quiet Shield Blender includes a Jamba Recipe Book for smoothies, whole juices, dips, and marinades. Longer 5 year warranty. 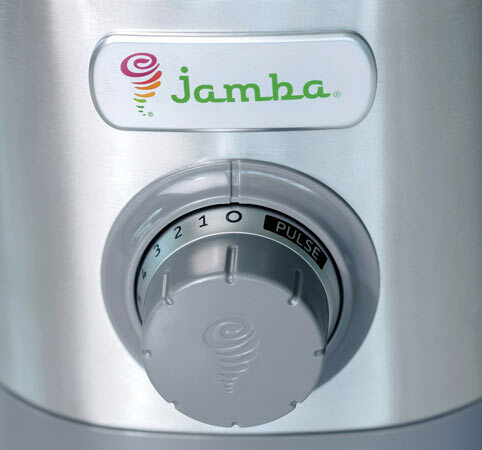 Jamba Quiet Shield Features: The Jamba Quiet Shield 5819 Blender has an easy to use variable speed control, with Pulse. A sturdy base will prevent movement or slipping during operation. You will receive 1 Recipe Book. Oster Warranty: 5 year Limited Warranty. What’s in the Box? : Jamba Quiet Shield 58916 blender, Tamper, 32oz & 20oz Container, Recipe Cookbook. Smart-Review Commentary: The Jamba name is well known for Jamba Juice Smoothie Shops Nationwide. 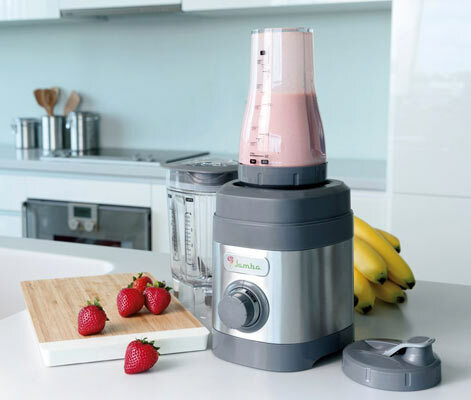 Jamba appliances has designed a Quiet blender. The Jamba Quiet Shield Series is one of the quietest blenders we have reviewed with an enclosure to limit sound. This would be important if you did not want to disturb others, say while making your morning smoothie, or disturb your neighbors if in an apartment. In addition to this the Jamba 58916 model is powerful, with a 1.6 HP motor. This is an ideal smoothie maker. The Variable speed dial allows you to finely tune your power, as is easy to use. This model comes with a 32oz BPA-free container, and a 20-ounce Travel Cup. Both have stainless steel blades. Another plus for this blender is a longer 5 year warranty. 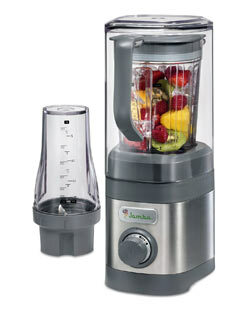 Jamba Quiet Shield has received outstanding consumer and professional reviews for a blender in its price range. This unique Jamba quiet blender is not only a Smart-Review top pick but also won our Best of 2017 award for Blenders under $150.